The iPhone isn’t the only Apple product getting a July makeover. Apple is also revamping .Mac, its collection of Web-based tools. Starting next month, .Mac gets new applications, a new focus on mobility, more iPhone-friendly features, and a new name—Mobile Me. We’ve watched Apple’s Worldwide Developers Conference keynote, talked to Apple executives, and perused the materials on the company’s Web site to get a better grasp on this new online service. Here’s what to expect when Apple throws the switch, and .Mac transforms into MobileMe. MobileMe replaces Apple’s .Mac service. It retains many of the features of .Mac—such as online storage and Web page-hosting, just to name a couple examples—but the revamped service places a greater emphasis on synchronizing information between your various devices. MobileMe users will be able to take e-mail, contacts, and calendars and share them seamlessly between a computer at work, another computer home, and a mobile device like the iPhone or iPod touch. And the key to all of this is synchronization and push technology. Push technology? Sounds buzzwordy. What does “push” actually mean? Push services are particularly critical in business settings where users want the data on their mobile devices to be current and up to the minute. In the corporate world, that usually means an Exchange server coupled with Microsoft’s ActiveSync synchronization service—corporate users can access e-mails, appointments, contacts, and other data on a company’s server, and new information is pushed out to a user’s mobile device. In fact, Apple has licensed ActiveSync specifically to make the iPhone more attractive to enterprise customers using Exchange servers. MobileMe works on the same principle—you access the same e-mail, contact, and calendar information whether you’re on a Mac or PC, iPhone or iPod touch. (Hence, the “Exchange for the rest of us” theme that Apple’s marketing team has adopted.) And you don’t have to take any action to get that information onto your device—whenever there’s a change, it gets pushed to you and your assorted devices. OK, so how does it actually work? 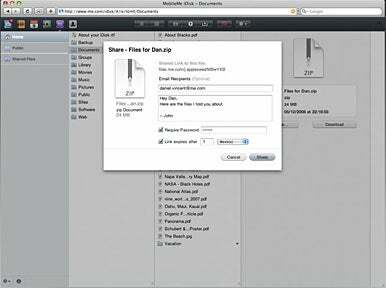 With MobileMe, e-mails, calendar events, and contacts are stored on a secure online server, which Apple calls “the cloud” in its video guided tour of MobileMe. That’s a jargony way of saying that the information is stored in a place you can reach, via a network connection, regardless of where you are and what device you’re using. 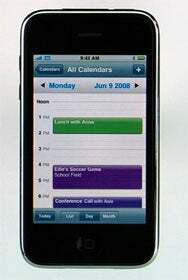 Update a calendar on one device, and with MobileMe, the new event will appear on all your devices, such as the iPhone. So let’s say you add a new appointment to your personal calendar from your Mac. That appointment is received by the secure online server and is then pushed back out to all your other devices: for instance, the appointment might pop up on your iPhone’s calendar right away. It works in reverse, too—changes on one device are sent back to the server and instantaneously updated on your other devices. Add a contact to your iPhone? It’ll appear in Address Book on your Mac. And photos are part of the mix, as well. If you update a contact’s photo on one device, that change will be reflected on all other devices. What programs does MobileMe work with? If you’re using a Mac—and because you’re reading this article, we assume that you are—MobileMe will work in conjunction with Mail, Address Book, and iCal. For Windows users, MobileMe works with Microsoft Outlook on either Windows XP or Vista. (Outlook 2003 or later is recommended.) And, of course, the online service works with the mail, calendar, and contact applications on either the iPhone or iPod touch. It’s unclear if there will be some framework to allow other Mac programs, such as Microsoft Entourage, to sync with MobileMe. Apple says the service was specifically designed to work with Mail, Address Book, and iCal on the Mac. And that’s all there is to it? What will be available at Me.com? Me.com will host a suite of Web applications that will be familiar to anyone who’s used Mail, iCal, and Address Book. After you provide your member name and password on the login page, you’ll be taken to a home page that sports a toolbar with all the MobileMe apps—Mail, Contacts, Calendar, Gallery and iDisk. (A sixth Toolbar button lets you access Account Settings). 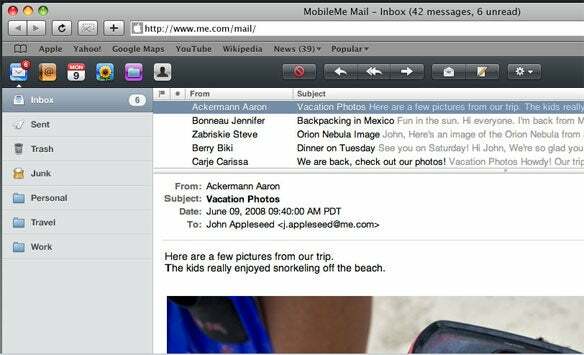 MobileMe Mail’s interface mirrors that of the built-in Mail client for OS X, with an Inbox as well as specific mail folders. The Mail app includes an auto-complete feature for filling in addresses as well as a Quick Reply tool, unique to the Web version of Mail, that lets you reply to a message without opening it. Other features include the ability to flag e-mails and to drag-and-drop messages into folders—again, the sorts of things you’d expect from the Desktop version of Apple’s Mail. MobileMe Mail is jut one of the apps available online when Me.com launches. Contacts on MobileMe looks like the Mac OS X version of Address Book. You have a three-pane view that, from left to right, shows you groups of contacts, an alphabetical listing of contacts in the selected group, and then info for a specific contact. You can browse by scrolling through the alphabetical list or by typing a contact’s name into the search box in the upper-right corner of the app. As for MobileMe Calendar, it looks like—you guessed it—iCal. The calendar app is a new addition to Apple’s online offering, as mail and contacts existed in .Mac form (that is to say, without the push aspect that Apple is touting with MobileMe). It offers month, week, and day views as well as multiple calendars, each with its own specific color. You can create events by clicking on the calendar interface and dragging the subsequent box to set the duration; drag-and-drop functionality also lets you move events from calendar to calendar. Any Mail, Contacts, or Calendar changes you make in the Me.com browser interface show up on your iPhone and in your Mac OS X apps. It’s the successor to .Mac’s Web Gallery—a place where you can store and share photos online. As with Web Gallery, you can upload and arrange photos, select sharing and display options, and generate a URL where other people can view your photos. You’ll be able to upload photos to MobileMe from iPhoto, Aperture, and your iPhone, just as you could with .Mac. And Apple TV owners will still be able to watch slideshows via the Photo menu on their set-top box, as they could with .Mac’s Web Gallery. What browser do I need to access Me.com? Apple says “any modern Web browser,” which means Safari 3 or Firefox 2 (and presumably the just-released Firefox 3) on the Mac and Safari 3, Firefox 2 and 3, and Internet Explorer 7 for XP and Vista users. Any other system requirements on the Mac? Subscribers will need Mac OS X 10.4.11 or later, though Apple also notes that some MobileMe features require Leopard (not to mention iLife ‘08). I’m already a .Mac subscriber. What happens to my account? When MobileMe become available in July, Apple will automatically switch your .Mac account over at no cost. You’ll get a change-of-service e-mail at your .Mac address when Apple makes the switch. (Here’s the MobileMe notification letter sent to Macworld’s .Mac account.) However, Apple does recommend you do a couple of things _before_ the switch to ensure a seamless transition: 1) set up your Mac to sync contacts and calendars and 2) upgrade to the latest version of your favorite browser. What about my mac.com e-mail address? Will I have to change that? Apple says you’ll also be able to use either email address—mac.com or me.com—as an Apple ID for iTunes and Apple Store purchases. The addresses will work separately as iChat IDs, however. Will I still be able to use .Mac features in MobileMe? Most of them. According to Apple, features such as Back to My Mac, iWeb site publishing, and iDisk access in the Finder aren’t going anywhere. You also be able to share photos and movies from iPhoto ‘08 and iMovie ‘08 as you could with .Mac. And you can continue to sync contacts, calendars, and bookmarks between Macs. Are any .Mac services going away? Why are these services getting dropped? Apple hasn’t said. But a reasonable guess might be that they’re either dated services, under-used, overtaken by other features, or just don’t fit in with the overall focus of MobileMe. Where does the MobileMe iDisk show up? In the Devices section on the Finder’s sidebar, just as with .Mac. No, I meant where does it show up if I’m using Windows? If you’re using Vista, you can mount the iDisk as a networked drive and access it by way of Windows Explorer, just as you can the current incarnation. Anything else different about iDisk? iDisk now features a way to share files that are too large to send over e-mail. Are those all the changes? Not quite. Your storage limit is going to double—from 10GB to 20GB if you’re an individual subscriber, and up to 40GB (20GB for the main account and 5GB for each sub-account) for .Mac Family Packs. Apple notes that these storage increases will take effect after MobileMe’s launch, so it might be up to 10 days before your account reflects its new capacity. But I upgraded my .Mac storage. Apple says it will honor those upgrades at no additional cost. Let’s say you bought a 10GB storage upgrade. Well, that’s now a 20GB upgrade, meaning you have 40GB of total storage. Updated at 9:48 a.m. PT to correct and update information on Microsoft Outlook compatibility.